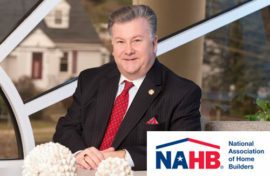 Holbrook and Braintree, MA (January 4, 2019) – Full-service real estate and property management firm Peabody Properties is pleased to announce that Scott Ployer, Vice President of Facilities and Capital Planning, has been named Builder of the Year for 2018 by the Builders and Remodelers Association of Greater Boston (BRAGB). Ployer is responsible for all technical services provided to Peabody Properties, Inc. properties and directs all sustainability initiatives. His pivotal role within the company includes working with more than 160 employees to expand the efficiency of the firm’s facilities operations. Ployer, a resident of Holbrook, Massachusetts, has nearly 30 years of experience in residential and commercial real estate and facilities and asset management. He accepted the award during a recent ceremony held at Granite Links Golf Club in Quincy.